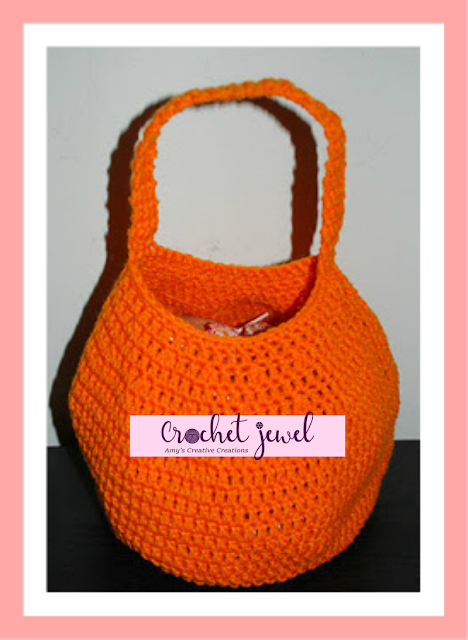 Enjoy this Pumpkin bag for your Halloween for you kids or to pass out candy! Magic Circle Video, this Video is for 11 dc, but I only did 10 dc in the Magic Circle for this pattern. rnd 6: ch 3, (Counts as first Dc), dc in each front loop around to have it stand up, sl st.
rnd 16: ch 3, (Counts as first Dc), dc in the 2 next two dc, 2dctog decrease in the next dc, *dc in the next 3 dc, 2dctog decrease in the next dc. Repeat from * around, join with sl st.
rnd 17: ch 3, (Counts as first Dc), dc in the next dc, 2dctog decrease in the next dc, *dc in the next two dc, 2dctog decrease in the next dc, Repeat from *around, join with sl st.
rnd 18: sc in each dc around for the edge. sl st. Continue on with the handle. rows 2-4: sc in each sc across, Turn, Repeat for 4 rows, Sl s on both side of the top of the bag to secure. Fasten off and Weave in the ends. I love this pattern, but on round 3, while still doing 2 dc per existing stitch, 30 dc is mathematically impossible. You get 40 dc, so did you mean 1 dc, then 2 dc in next stitch after the starting of the round or exactly as written?